Tonight, as I sat watching a movie on my computer, I realized as I played with my semi-bangs (yes, they're pretty much over and done with, but a quick trim yesterday brought them "semi-back" to life, to help with the grow-out phase), that I had never brought to light one of my favorite products that I use just about every other day. If you're like me (well for one thing, I know all you island mamas have to reckon with this one), you sweat. Sometimes a lot. But if you're REALLY like me (we're talkin bangs and ALL), you know just how oily your forehead area can get, if not given the proper attention. Anytime you let your hair hang in your face, you're just askin' for trouble. Sure it's cute, and can cover a multitude of sins, but the oil from your hair can really do a number on your forehead by creating a nice slick of grease. In turn, that reciprocates the deal right back to your hair which starts getting piece-y and looking unwashed. And that's not even to mention the atrocities that can occur when using using product! Think about it--have you noticed that friends and not-so-great friends have been smiling at you abnormally often and for longer periods of time lately? It's not because they're thrilled by your presence. It's because your face is acting as a superb reflector, much like a mirror. Now, what can you do about all of this? You can reach for some kleenex, and do a quick swipe every few minutes. Or even tissue paper can get the job done when you're really in a pinch. But I've found something better. 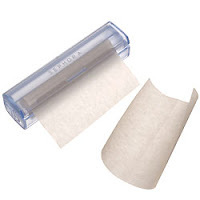 Sephora's Roll-Up Blotting Papers ($6) are the answer to your every oily need. You don't want those little papers that come in the matchbook looking packages, because they're often coated in powder (which *ahem* is not your color. Don't even question me on this one. Since when was your skin tone pink? Or orange? No, not you, not you.) What you want, is something that is so simple to unroll, but has the most efficient case you've ever imagined. We're talkin, Seran Wrap type-packing for your face. Just pull out, rip off (yes, you know the motion from covering your leftovers), snap the holder shut, and blot your face dry. Mine has lasted for over a year, and quite frankly I'm exhausted of giving you reasons to get to Sephora.